You can download a PDF version of the functionality spec here. Please go through the steps below to set-up TiDaeX™. Go to e-jobsheet.com and click 'Register' from the right side of the homepage. 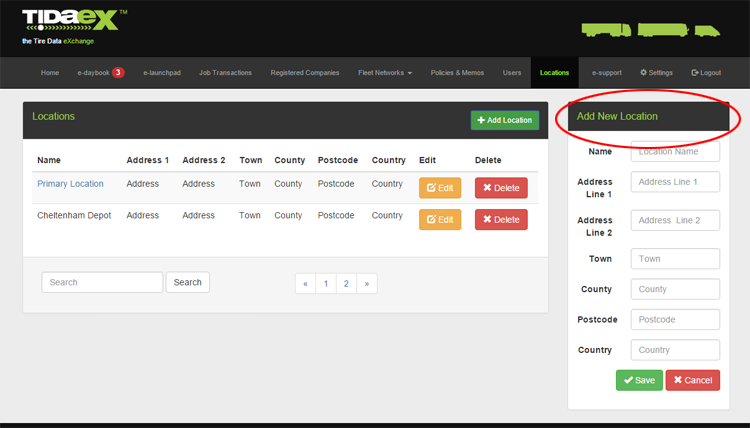 You will need to fill in all field details and then click 'Register'. 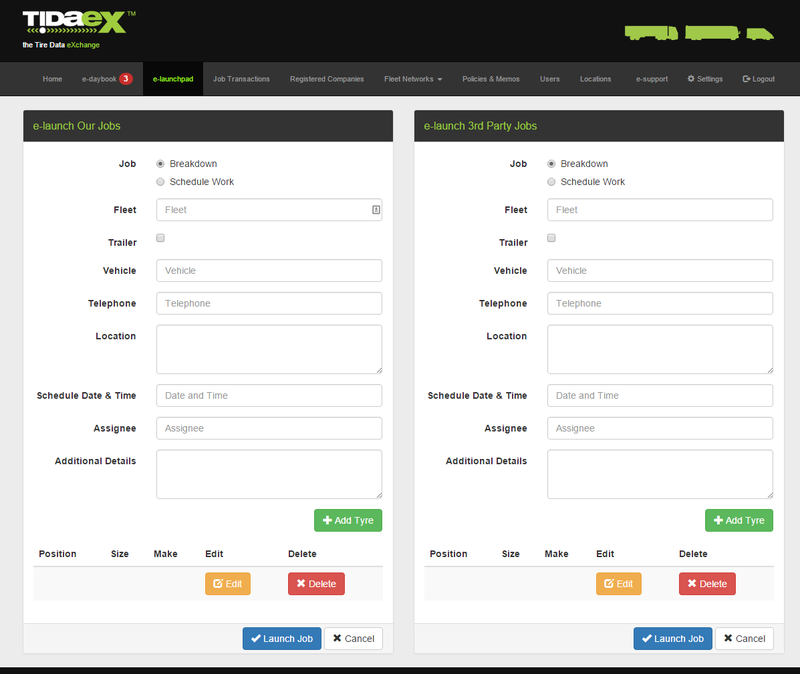 This will submit your registration details onto TiDeaX™ and as a result, your administration login details will be emailed to you. Don't forget to double check your junk/spam folder for your TiDaeX™ login instruction email after you have completed the registration process. Please ensure that you are defining your core business in the second field, termed 'Trade'. This will govern your company's interaction with TiDaeX™. *Please change your password details once you have logged on for the first time to ensure that you have unique password information. In this example there are already locations defined. Use the add new locations section to add all of your locations in turn. Next you will need to set up all of your users. The person who originally registered the company on TiDaeX™ will be automatically set up as an administrator. Please note that only individuals defined as a ‘Fitter’ on TiDaeX™ will receive a login to the e-jobsheet tablet app once activated by the administrator. 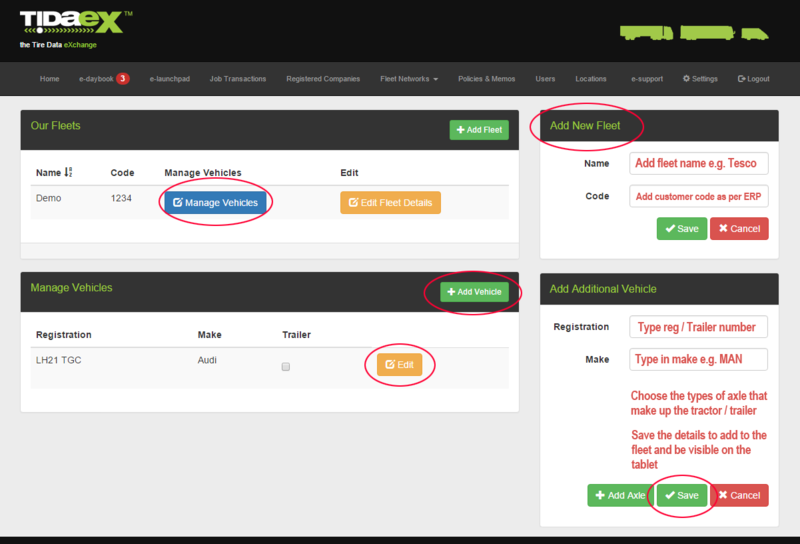 Once you have a fleet created in TiDaeX™ you can then start adding vehicles to that fleet. This section details each and every registered company on TiDaeX™, be that Tire Service Provider, Manufacturer or Tire Dealer Network, all of whom can be contract holders. All registered companies are presented. 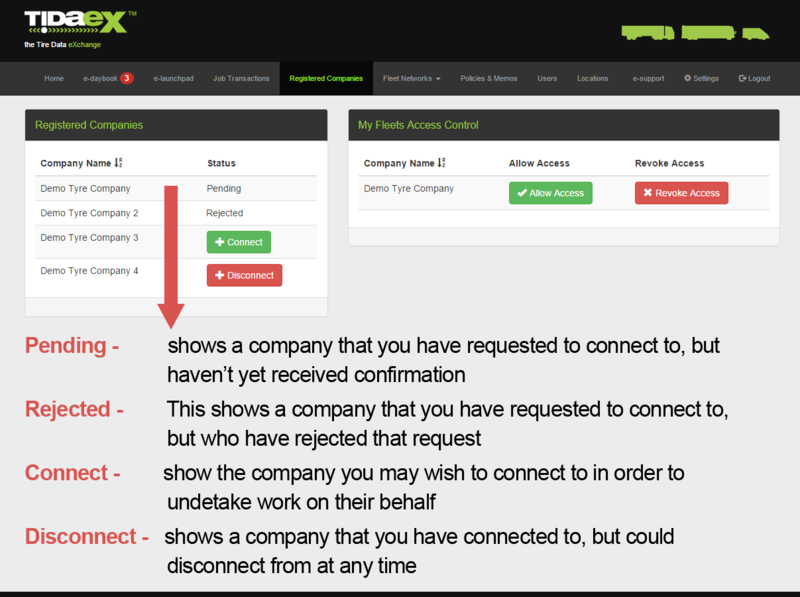 Should you wish to connect to a third party through TiDaeX™, you will have to request a connection with them. If a third party company should like to accept your connection request, you will gain access to one, some or all of their fleets where they are contract holders, at their discretion. 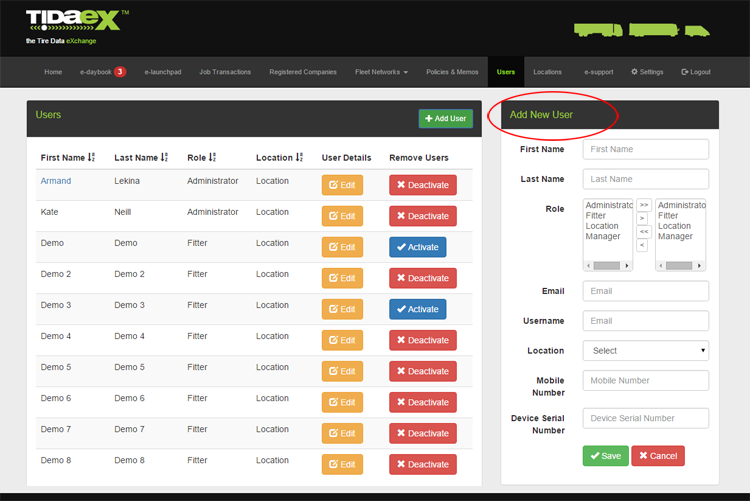 e-launchpad provides the facility to send work requests out both to your own fitters and to your third party connections. Complete the launch form. Once you have imported or accumulated data in TiDaeX™, you should be able to start typing and the system will auto populate the boxes, i.e. fleet, registration number or customer code. All information will be sent to the tablet and the fitter will have a reference to the work that has been launched. The e-daybook grid provides an overview of all work that is out in the field. The user can also see the status of any work in progress. The warning notification denotes jobs rejected by a fitter, and the grid can be filtered by rejected jobs in order to redistribute as a priority. The home screen is a dashboard view of work on going in the field, at a glance. 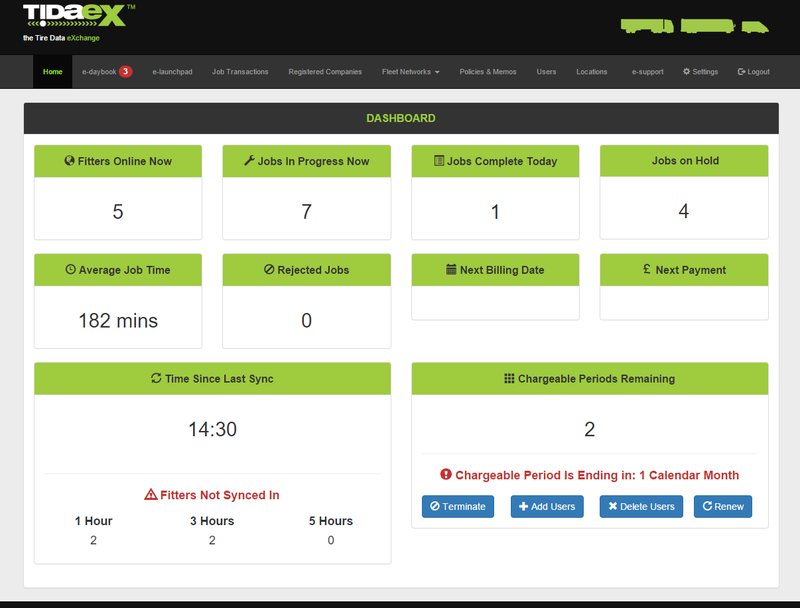 The user also has an overview of the next payment instalment due date and, the expected next payment value. It is recommended that fitters use one of the main/high volume android tablet manufacturers (such as Acer, Archos, Asus, Lenovo, Samsung). Due to their experience in consistently producing Android based tablets, in theory you should expect to take delivery of a tablet product with android configured on the hardware to its best potential. Of note is the Samsung Galaxy tab 8”; these are good value for money and make for a decent user experience. Minimum RAM suggestion of 1GB. Anything under this may make the tablet feel a little slow or unresponsive when in use. SIM-enabled tablets are not mandatory, but using WiFi only tablets is highly discouraged. We do not recommend WiFi only options as work should never be stored on a tablet any longer than necessary, as this poses a risk of information loss should the hardware fail prior to a successful synchronisation with TiDaeX™. A SIM-enabled device approach helps to mitigate this risk. A dual camera (front and back) device is recommended for utilising the attach photo functionality. Please also note, the initial release of the e-jobsheet app will be in Portrait mode only. Download the e-jobsheet app from the Google Playstore. Look for this logo.